In early winter of 1986 the Special Collections Department became the repository for one of the great American collections of French books dating from the sixteenth to the nineteenth century, arguably the most important collection of its kind in private hands before it was bequeathed to the University of Virginia by the late Douglas Huntly Gordon. A prominent Maryland attorney since 1930, Baltimore preservationist, former president of St. John’s College in Annapolis, president of the Municipal Arts Society of Baltimore from 1935 to 1970, Mr. Gordon was a recipient of the French Legion d’Honneur and Palmes Académiques and one of the most distinguished American bibliophiles collecting in the twentieth century. At the time of his death in late March 1986, he had amassed 1,243 volumes of early French literature. Over 600 were printed before 1600, many in bindings of the period. Almost all of the others are in elaborate morocco bindings by the finest French craftsmen of the eighteenth and nineteenth centuries. A Francophile since undergraduate days at Harvard, Mr. Gordon made the first purchase for his extraordinary collection in 1923 from a Parisian bookseller’s stall on the Seine. It was a first edition of the Journal de Voyage de Michel de Montaigne, an appropriate beginning for an impeccable library of French Renaissance volumes, although the account of Montaigne’s travels in 1580-81 was not published until 1774. Later, Mr. Gordon acquired all the major editions of Montaigne’s Essais published in the author’s lifetime and the works of virtually every important writer of the period: Ronsard, Du Bellay and their fellow members of the Pléïade group, Estienne Jodelle, Rémy Belleau, and Pontus de Tyard. Earlier Rhétoriqueur poets are included: Jean Molinet, Jean Marot, Jehan Meschinot, and Mellin de Saint Gelais, among hundreds more. Jean Marot’s son, Clément, the best-known poet during the reign of François I, is represented by several volumes including a first edition of the Blasons anatomiques du corps féminin from 1543. There are, as well, contemporary poetical treatises such as Thomas Sebillet’s Art Poetique Francoys which outlined the rules for pre-Pléïade poetry, using works of Marot and the Rhétoriqueurs as examples. Maurice Scève, whose hermetic dizains, the Délie (1544), have received renewed critical interest in recent decades, is present here, as well as the Oeuvres (1556) of Louise Labé, Scève’s contemporary and fellow Lyonnaise poet. Of outstanding importance among the Renaissance authors in the collection are the works of François Rabelais, the great humanist physician, creator of Gargantua and Pantagruel. A copy of his Quart Livre (1552) is the only example known to Rabelais bibliographers of this edition printed by Jean Chabin. It is complemented by another 1552 edition of the Quart Livre printed by Michel Fezandat. Among other Renaissance story tellers is Marguerite de Navarre sister of François I and an influential force in the political and religious life of her brother’s court. 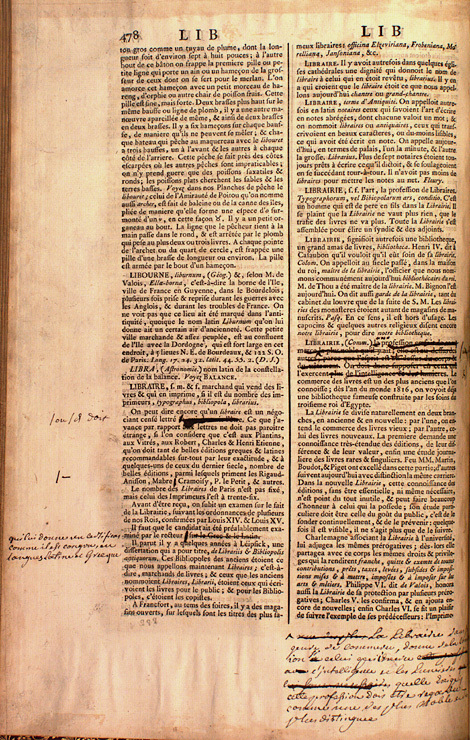 Early editions of works produced by the Estienne brothers, Robert and Henri, and other volumes essential to an understanding of the intellectual history related to the Reformation are prominent in the Gordon Collection. Unquestionably, the most important title in the collection is from a period later than the Renaissance. This is the magnificent thirty-six volume Encyclopédie, ou Dictionnaire raisonné des Sciences, des Arts et des Métiers … (1751-1780), the Diderot Encyclopedia. There is a supplementary volume containing 300 proof pages with corrections, many in the hand of Denis Diderot. This volume was apparently made up by one of the editors of the Encyclopédie, almost certainly André Le Breton who is known to have effected the unauthorized censorship of many of the articles by Diderot and other contributors. These proofs are in the original settings before Le Breton’s editing and are, therefore, of greatest significance to scholars of the Encyclopédie as the only known source of Diderot’s full uncensored texts. 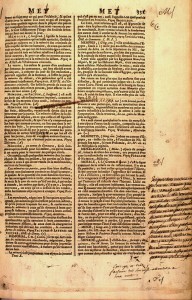 Closely connected with Le Breton are copies of writs tipped into the volume that were served on the publisher forbidding the sale or distribution of the Encyclopédie in 1752 and 1759. 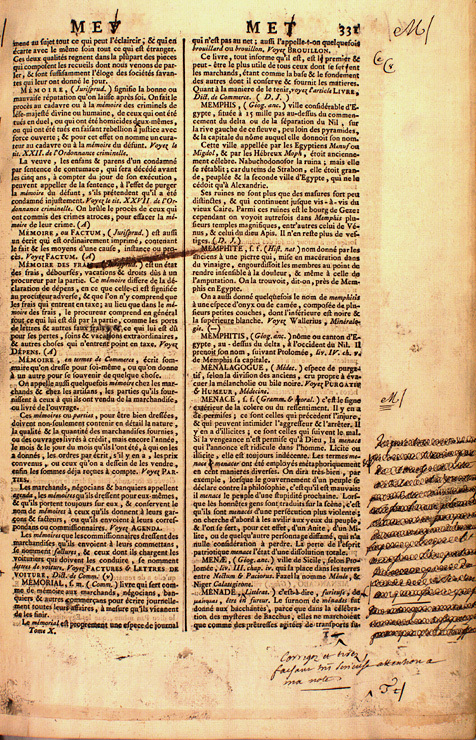 Volume One contains the original sanguine wash drawing by C. N. Cochin of the engraved frontispiece and an early 1745 prospectus announcing a five-volume work to be translated from the English Universal Dictionary (1742) of Ephraim Chambers, a plan subsequently discarded when Diderot joined the multi-volume project. This unique set of the Encyclopédie is bound in full red contemporary morocco with elaborate arms (unidentified) gilt-stamped on the covers. Present in each volume is the bookplate of the Russian General Staff, dating from about 1840. It is known that Diderot sold his entire library to Catherine II of Russia where it is still kept intact in the Russian National Library of St. Petersburg. Nevertheless, some scholars believe that this set was part of his library. The arms on the covers make this theory unlikely, although not altogether impossible. Mr. Gordon bought the set from an English bookseller in 1933. In 1947, he collaborated with Norman L. Torrey in the publication of The Censoring of Diderot’s Encyclopédie and the Reestablished Text (Columbia University Press). Their research was based on this copy. There are other works by Diderot and a broad representation of literary culture of the Enlightenment from Montesquieu and Voltaire to l’Abbé Prévost (Manon Lescaut ) and Choderlos de Laclos (Les Liaisons Dangereuses ). The nineteenth century is strongly represented by all the leading figures in that rich period of French literature and fin de siècle letters: Balzac, Victor Hugo, Alphonse Daudet, Prosper Merimée, Maupassant, Alfred de Musset, George Sand, Théophile Gautier, Flaubert, Sainte Beuve, the Goncourts, Baudelaire, Anatole France, Edmond Rostand, Pierre Louys, Huysmans, Proust, and Pierre Loti. The addition of the Gordon collection to the Special Collections Department’s holdings provided an incomparable source of primary material for doctoral students writing dissertations in literature of the French Renaissance and later periods. In the past, these scholars were obliged to travel to Paris or to such libraries as the Folger, the Beinecke, or the Houghton in order to examine editions of this quality. Because many of Mr. Gordon’s books are not available in editions held by these other American libraries, the University of Virginia is now considered one of the most important American centers for research in French Renaissance and Enlightenment literature. All the volumes of the Gordon Collection have been cataloged and records are available in the Library’s online catalog, VIRGO. This article was adapted from one published in the Library Associates’ publication, Chapter & Verse. A selection of sixteenth-century books from the collection are currently being digitized for a collaborative project undertaken by the University of Virginia Library and the University of Virginia French Department with the generous support of the Florence Gould Foundation. Complete digital facsimiles are being created and can be viewed on the project’s website, the Renaissance in Print: Sixteenth-Century French Books in the Douglas H. Gordon Collection.